Meant to share this last week, since it tied into my post about the state of our civilization, and the difficulty of keeping the broad sweeps of history in sight, but it fell between the cracks until now. The world is becoming a better place…slowly. TWO decades ago the extremely poor accounted for more than a third of all workers in developing countries, around 750m people. Today their numbers have halved. The fastest-growing group are those considered “middle class”: they now represent 40% of the labour force in poor countries. Our chart, based on a report released today by the International Labour Organisation ILO, shows the degree to which workers’ prospects have improved. “For the first time in history, over the next several years, most new jobs in the developing world are likely to be of sufficient quality to allow workers and their families to live above the equivalent of the poverty line in the United States,” states the ILO. Yet the progress is not evenly spread. Most middle-class job growth occurs in Latin America, east Asia and central and southern Europe. Across south Asia and sub-Saharan Africa most growth is expected among the “near poor”—those at the fulcrum between middle class and poverty. 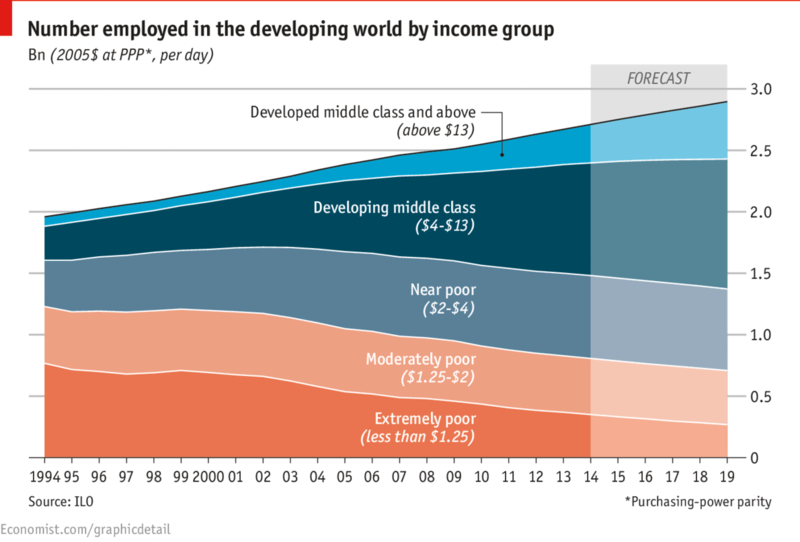 via Daily chart: March of the middle class | The Economist. This entry was posted in Zeitgeist and tagged Asia, Economy, International Labour Organization, Latin America, Middle class, Poverty in the United States, Southern Europe, Sub-Saharan Africa, Third World, World. Bookmark the permalink. We hear a lot about the rise in inequality these days. This graph demonstrates that on a global scale the opposite is happening. The rich are getting richer and the poor are getting richer too. True. I suspect some of this is because globalization is squeezing the working classes of the more developed countries.